Many people think make up is the only way to look beautiful. That's not really true. 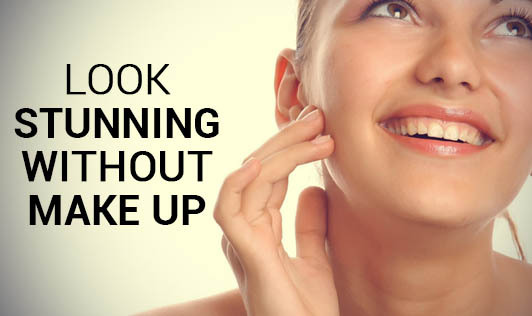 Most of the time make up is used to cover up your flaws and is a temporary measure. Try these simple steps to cut out all the time spent in front of the mirror. Skin Care: Protect your skin every day. Follow the 3 golden steps: Cleansing, toning, moisturizing . Keep skin moist and supple. Use a toner after you cleanse your skin. Usually toners are important for removing the drying chlorines and minerals found in tap water. Shape Your Eye Brows: Make sure that you keep them in shape. Keeping your eyebrows neat and tidy can bring your face a lot of beauty and elegance. Healthy Diet: Eating a balanced diet with a variety of vitamins, minerals and amino acids will have a good effect on your skin and hair thereby making it healthy and vibrant. Drink plenty of water during the day. This will keep your skin moist Also, let your skin sweat naturally. This keeps pores open and displays the natural complexion. Healthy Lips: Make sure your lips are also well hydrated to avoid chapping lips while brushing your teeth. Don't forget to give a last round of brush on your lips. This removes dead cells on your lips and gives a good blood circulation to your lips. Drink water whenever you feel like your lips are getting dry; also use a good lip balm on your lips to keep it supple. Hairdo: Choose a hairstyle according to the shape of your face. Take care of your hair to make it look more attractive. Wearing the right hair style will considerably add to your looks. Power Nap: Most people don't realize that sleeping for fewer hours usually takes a toll on their body. Make sure you get your daily dose of sleep which is 6-7 hours every day. It adds brightness to your face. Many scientific studies have shown that regular use of certain make up products can lead to skin cancer and other skin problems. There is nothing better than natural beauty, and who doesn't appreciate it!! The most essential of them all - Don't forget that million dollar smile on your face and learn to love yourself!